You can take your motorbike on the Cat Ferry. Motorcyclists often describe Nova Scotia as paradise. There are over 7,400 kilometers of roads to ride, many of them hugging the coastline, and no end of picturesque fishing villages and coves to explore. Traffic is thin but the seafood restaurants are thick on the ground, which will make the decision of where to stop for lunch particularly difficult! A one week itinerary is enough to get a taste of the province. Two weeks is better to let you ride at a more relaxed pace and take in most of the main sights, including at least 3-4 days in Cape Breton. 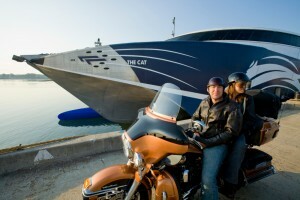 Many motorcyclists enjoy arriving by ferry. Don’t forget to book in advance in high season and take a moment to read the rules of the road before you get here. Renting a bike once you’ve arrived here isn’t so easy. Not many companies supply them. But the Bikers Bed & Breakfast near Truro caters to motorcyclists and does have a few machines that you can pick up for a trip around the province. There’s an acclaimed guide to Nova Scotia designed just for motorcyclists and best of all it’s free. Order yours here.